Watchlist by Jeffery Deaver, a Mysterious Review. 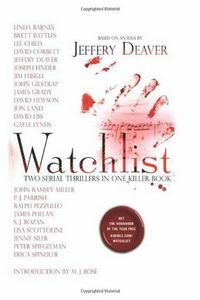 Review: Based on an idea by Jeffery Deaver, Watchlist consists of two "serial" novellas, each chapter of which is written by a different author. Deaver wrote the opening and closing chapters of The Chopin Manuscript and The Copper Bracelet, both of which feature a group of characters called the "Volunteers", a covert government group led by Harold Middleton. The Chopin Manuscript introduces Middleton, a musicologist retired from active service, in Poland to authenticate a previously unknown Chopin manuscript. As he's leaving the country to return to the US, he's detained by Polish authorities investigating the murder of the man who gave him the manuscript. Separately, the dead man's niece, Felicia Kaminski, living in Italy, narrowly escapes a murder attempt on her life, and hides out at the shop of an old family friend, who is in possession of a previously unknown Mozart manuscript that he was about to send off to Middleton. Their paths cross in the US as both are chased by a name known as Faust who is after the manuscripts … not for their inherent value as musical treasures, but for the secrets encoded within their notes. The Chopin Manuscript was co-written by Deaver and (in order of chapters written) David Hewson, James Grady, S. J. Rozan, Erica Spindler, John Ramsey Miller, David Corbett, John Gilstrap, Joseph Finder, Jim Fusilli, Peter Spiegelman, Ralph Pezzullo, Lisa Scottoline, P. J. Parrish, and Lee Child. Middleton finds himself drawn into an international terrorist plot in the sequel, The Copper Bracelet. A code name for an efficient method of making heavy water developed by the Nazis but presumably destroyed at the end of World War II, knowledge of the "Copper Bracelet" would give rogue nations the ability to develop nuclear weapons quickly and inexpensively. But the man who may hold the key to the formula, Devras Sikari, is also a target himself … with different factions having differing agendas as to how to use the knowledge and to what end. The Copper Bracelet was co-written by Deaver and (in order of chapters written) Gayle Lynds, David Hewson, Jim Fusilli, John Gilstrap, Joseph Finder, Lisa Scottoline, David Corbett, Linda Barnes, Jenny Siler, David Liss, P. J. Parrish, Brett Battles, Lee Child, Jon Land, and James Phelan. Though both stories are exciting, The Chopin Manuscript is decidedly the better of the two, its scope more focused and the plot better suited to the serial format. The Copper Bracelet also seems to assume knowledge gained from, or at the very least information provided by, its predecessor. Both, however, tend to generate suspense and thrills using plot twists that have little foundation. What is interesting is how the various writing styles of the authors, some of which are markedly different from each other, come together to form a cohesive thriller. Given that each author wants to put their own spin on the story, and each seems to have been assigned a specific task (introduce this character or setting, advance the plot in this way or that, add this twist, etc. ), it works surprisingly well. And, considering that most thrillers are at least 100 pages too long anyway, keeping these novellas to around 200 pages works to their advantage. Acknowledgment: Meryl L. Moss Media Relations provided a copy of Watchlist for this review.